The rent at River Oaks Condominiums Apartments ranges from $1,195 for a one bedroom to a $1,625 two bedroom. Apartments in this building are about 4% less expensive than the La Sierra average. This is a pet-friendly apartment. River Oaks Condominiums Apartments is a 19 minute walk from the 91/PVL 91/Perris Valley Line and the Inland Empire - OC at the Riverside-La Sierra Metrolink Station stop. This apartment is in the La Sierra neighborhood in Riverside. Nearby parks include Collett Park, Myra Lynn Park and Arlington Park. 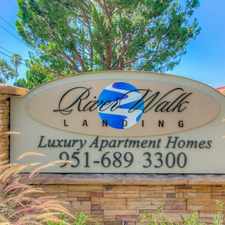 River Oaks Condominiums Apartments has a Walk Score of 70 out of 100. This location is Very Walkable so most errands can be accomplished on foot. Situated among peaceful shade trees and calming streams, River Oaks Condominiums offers condominiums conveniently located between downtown Riverside and Corona. Located near Tyler Mall. Our community includes an invigorating swimming pool and spa, a barbecue island, fully equipped fitness center and lighted tennis court. Explore how far you can travel by car, bus, bike and foot from River Oaks Condominiums Apartments. River Oaks Condominiums Apartments has some transit which means a few nearby public transportation options. River Oaks Condominiums Apartments is in the La Sierra neighborhood. La Sierra is the 5th most walkable neighborhood in Riverside with a neighborhood Walk Score of 49.